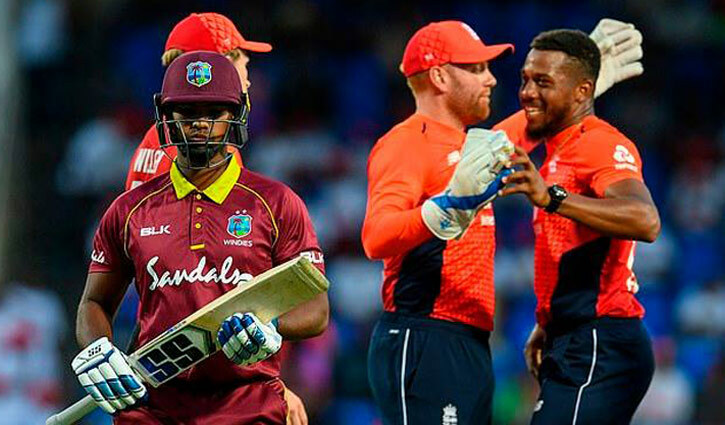 Sports Desk: England dismissed West Indies for just 45 - the second-lowest score in T20 internationals - to win the second T20 by 137 runs in St Kitts and wrap up the series with a match to spare. Chris Jordan took 4-6, the best figures by an England bowler in T20s, to skittle the dismal hosts in 11.5 overs. Sam Billings earlier hit a career-best 87 and Joe Root made 55 as England recovered from 32-4 to post 182-6. Only the Netherlands have scored fewer runs in a T20 international, making just 39 against Sri Lanka in the 2014 World T20. This was England's biggest margin of victory by runs in T20s and the fourth biggest of all time. The final T20 is also at Warner Park in St Kitts at 20:00 GMT on Sunday.